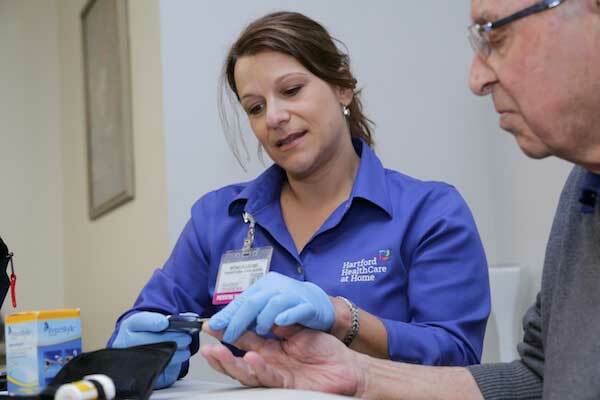 The Hartford HealthCare at Home Transitional Care Nurse provides patients in the community with a unique service. Unlike traditional homecare services, you do not have to be homebound to receive this free service from a Registered Nurse. A Transitional Care Nurse provides a patient-centered, free visit to people in the community who are not currently receiving certified homecare services. Our goal is to keep people healthy and safe in their home. We provide health education, assist with connecting you to community resources and communicate with your physician, case manager and other members of your health care team. Q: Who is eligible for a Transitional Care Nursing Visit? A: Anyone who has a primary care physician or specialist involved in their care! All you need is an order from your doctor, nurse practitioner, or physician’s assistant. Q: What happens after the Transitional Care Nursing Visit? A: If the patient doesn’t meet the criteria for homecare, the Transitional Care Nurse will continue to call for a 30-day period or longer if needed, to ensure the patient is safe and managing their care. We are here to help answer questions and provide support in many ways.